In a matchup between two top-15 teams, it took some last-second heroics from both sides before one could be declared the winner. To end the first half, it was Puck Pentenga giving No. 12 Northwestern a halftime lead with just five ticks remaining on the clock. In the second though, it was Sky Caron for No. 13 Boston College field hockey tying the game up with just 4.8 seconds left, effectively forcing overtime. But in the end, it was Kirsten Mansfield—already with two assists on the day—getting behind BC goalkeeper Jonna Kennedy and putting one home 12 minutes into the second frame of overtime to seal the 3-2 victory. The striking similarities in the clutch shooting performances from both Pentenga and Caron earlier in the game ultimately represented what was a nearly identical statline from the two sides. Ranked just one spot higher than the Eagles (1-2) in the NFHCA Coaches Poll, Northwestern (2-2) indeed ended up victorious, but very little split the two sides throughout the game. 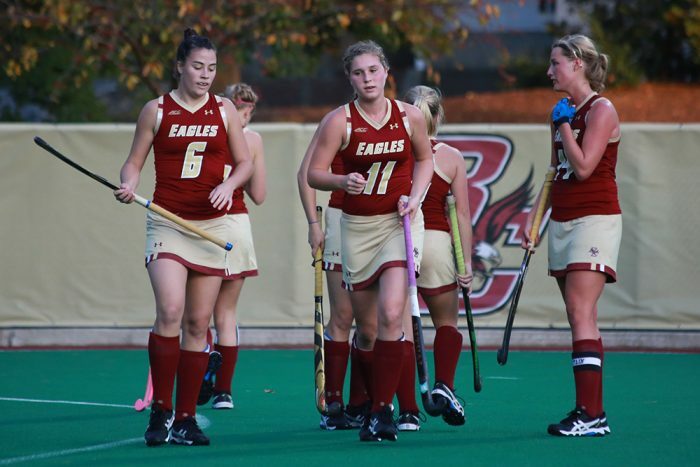 BC, in fact, totaled just one more shot than the Wildcats over the course of the game with 17 total strikes, while Northwestern edged by the Eagles in the short corner department by a 6-5 margin. If anything, BC was more aggressive. The Eagles suffered from two yellow cards, yet neither led to an opportunity for the Wildcats—who did not get hit with a single card in the game. In fact, it was shortly after coming back to equal strength at the end of the second half when Caron scored the equalizer on a penalty. And as far as goal scoring is concerned, the two teams were again indistinguishable. Twelve minutes into the game it was defender Frederique Haverhals scoring on a corner to give the Eagles an early lead. And Pentenga’s two goals—the one at the end of the first half being the most critical to the Wildcat’s momentum—both came off corners as well. That said, Pentenga’s performance should come as no surprise, as she entered the game leading her team in points with a goal and three assists through two games. Tripling her goal total on Sunday only means that last year’s All-Big Ten Dutch phenom is poised for another solid season. The win is already Northwestern’s second double-overtime victory of the season. Meanwhile, the Eagles are still looking for their second win overall, having played two of the top teams in the Big Ten conference this past weekend and currently hold an uncharacteristic losing record. Caron’s first career goal, however, should also be a sign of things to come. The freshman has shown the ability to make plays on her own since entering the starting lineup on Friday.